Angus “Mac” MacGyver, problem-solver extraordinaire, has been tasked with a series of high-risk missions and he needs YOUR help! MacGyver seems confused. Can you help him? 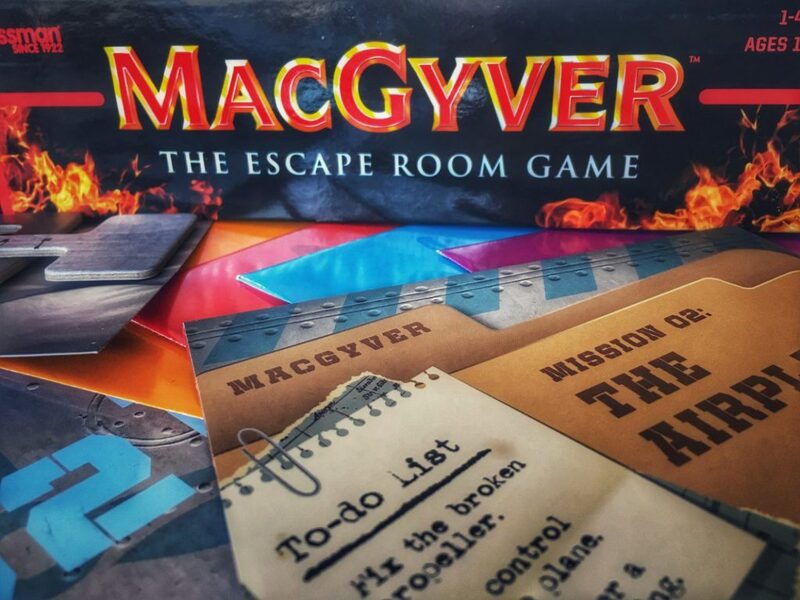 In MacGyver: The Escape Room Game, one to four players will work cooperatively with MacGyver himself to solve puzzles, discover secret codes, and get themselves out of trouble. The game includes 5 separate missions that can be played all in one sitting or over many sessions. Any components needed for a mission are in its envelope (except a pencil, paper, and scissors). Each mission is intended to be played only once, in order from 1 to 5, since objects will be damaged during gameplay. Occasionally, players will need to use items again in later missions so the game includes a Utility Bag to store them. Along with the included components, players must use a companion website to receive instructions, input answers, and keep in contact with an operative at the Phoenix Foundation. 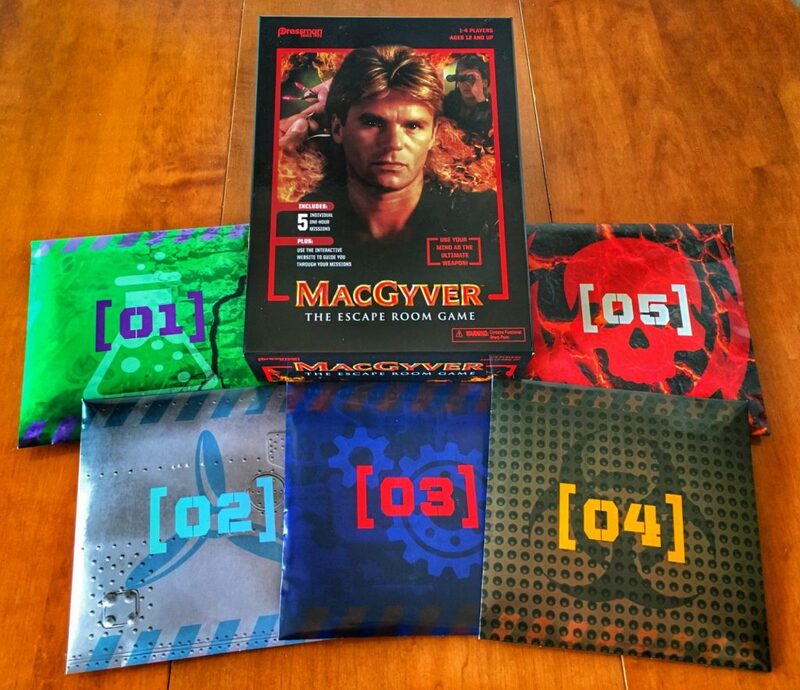 The missions in MacGyver: The Escape Room Game include Underground Lab, The Airplane, The Factory, Missile Silo, and Grand Finale. Each mission will have at least 3 objectives for you (and Mac) to complete. Some of the mission objectives involve stopping a chemical leak, landing a plane safely, breaking into a military complex, surviving an encounter with Murdoc, and cleverly using common, everyday items. When players begin a mission, they choose their difficulty level: Easy has no time limit, Medium gives 75 minutes, and Hard gives 45. I like the idea of choosing the difficulty for each mission, but unfortunately this choice is irrelevant. You don’t get more clues, the puzzles don’t get easier or harder, the mission doesn’t give you a score upon completion, and nothing happens once the timer runs out. Not to mention the timer itself doesn’t always work properly; a few times it began with 7 minutes less than what I had chosen and twice it started with only 1 minute. This is where I started to wonder if the website, like so many other MacGyver creations, was held together with chewing gum. If you’re stuck on a puzzle, you must turn to the website. In theory I like the tiered clue system they use; the first clue is quite generic, while the next clues go into more detail until you select the solution option. Alas even the most detailed clues are often vague and unclear (more on this coming up). Sometimes, the solution isn’t even given, leaving you with no way of progressing in the mission. The companion website is also where players will input their solutions and get the bulk of their instructions on how to work through a mission. It is not uncommon for it to direct you to “remove a red sticker”, “open the blue envelope”, or guide you through solving a puzzle. The stickers limit access within a mission, making it quite linear. This would be great if what it told you was accurate and clear. In practice, the information is spotty at best and misleading at worst. Maybe the site tells you to remove the red sticker without saying which red sticker. Other times it might ask you to remove two red stickers, but there’s only one left. 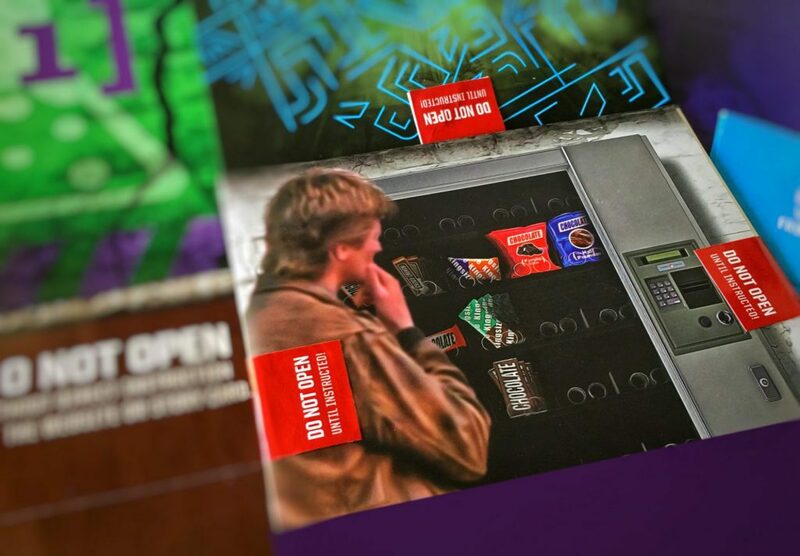 Sometimes there is a picture that accompanies the instructions, but often the picture shows the wrong sticker being removed. It is so important for instructions to be precise and clear in any escape room game so this inattention to detail is disheartening. MacGyver: The Escape Room Game has many problems, the biggest of which seem to come from lack of development and playtesting. First the website feels dated and needs a lot of work. It behaves better with some devices than others; so if you’re one of the unlucky ones, you may not be able to access important information. An example of a hint where the third clue and the solution are inaccessible on a mobile device. Secondly, you are given (seemingly) clear instructions on the website for how to solve a puzzle in the first mission: enter the letters from M to A. You do all the work to find the correct letters, enter them online, and then are penalized for an incorrect answer. You recheck your work, enter the letters again, and get another time penalty. 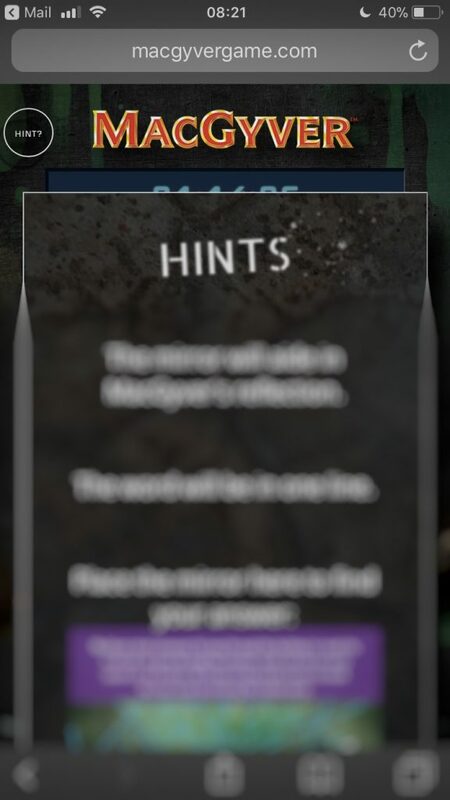 You even look at the hints, which suggest you do everything you have already done. You try again only to receive another penalty. Hopelessly, you look up the solution where you find that you were supposed to omit some of the correct letters (for some reason) and the letters were to be entered in order from A to M.
You are probably wondering, as I did, what information I missed along the way. The answer is nothing (and I confirmed this by giving the puzzle to others to solve without my guidance). I could continue on about vague instructions and inconsistencies in the puzzles, hints, and solutions. Suffice it to say, these problems appear in all the game’s missions, with some much worse than others. Update: I went back to the website a few weeks later to see if the instructions or solution had been fixed for the puzzle I mentioned in the first mission. Rather than clarifying the instructions, the fix was for there to be many solutions to the puzzle. As long as the minimum 5 correct letters are entered in any combination with whatever other letters preceding and following, your answer is considered correct. The “passed third grade math” recommendation is no joke, while the “do not heat up components” warning hopefully is. Finally, the other issues I had with the game relate to quality control. My copy had a red sticker covering up a solution, which tore the paper (read: the answer) when I tried to remove it. There were cards with misprinted information from a different mission and components that were glued together when they shouldn’t have been. A little extra care, development, and playtesting would have resolved many of these issues and made the game a much better design. I’ve watched Macgyver occasionally (although I credit Patty and Selma Bouvier for teaching me most of what I know about the show) so I had no Macgyver-related expectations. I did, however, go into it expecting to be challenged by a new and novel escape room game. Unfortunately, whatever camp your expectations fall under, I suspect you will be disappointed by MacGyver: The Escape Room Game. Thematically the game does transport you back to the late 80s. For fans of the show: the stories here aren’t very interesting, the game’s end is anti-climatic, and you never really quite feel the thematic ties to Macgyver, even when you’re defusing bombs with banana peels. For fans of escape room games: the puzzles aren’t challenging enough, the solutions are often loose, and it feels like the game tests your patience more than your problem-solving skills. 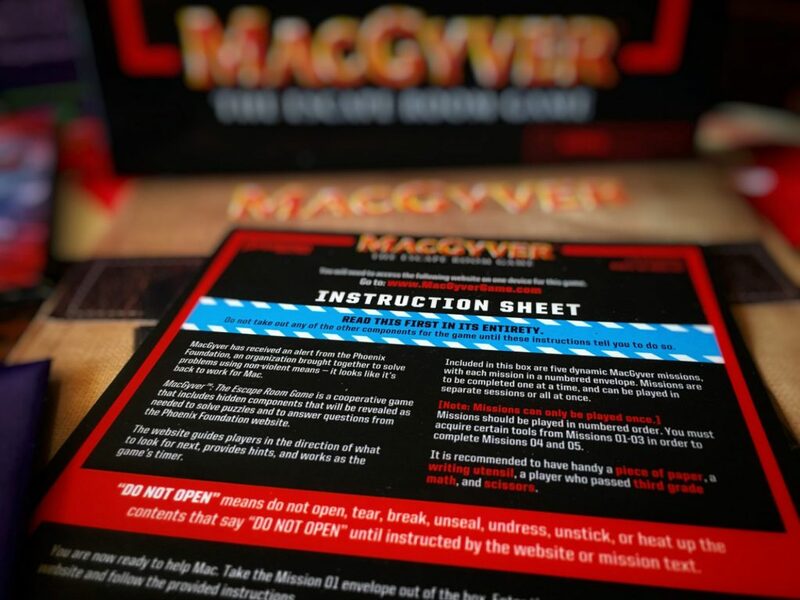 I really felt like MacGyver: The Escape Room Game had such potential, especially since I immediately fell for the component in-box organization. Each mission is packed nicely inside individually sealed envelopes, which reminded me of another mass market product, Escape Room: The Game. So I could forgive some of MacGyver’s production or website flaws if the puzzles held up on their own. The harsh truth is that as the game is now, they just don’t. Rather than the fun, brainy experience I would expect from an escape room game, this felt like an exercise in frustration. 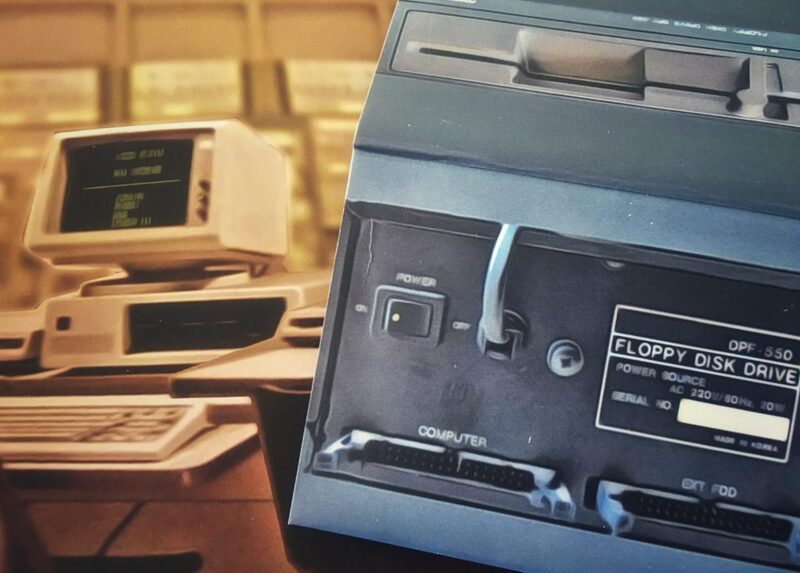 MacGyver: The Escape Room Game had the potential to be a decent, mass market game, if only it had been handled with more care – and that’s a real shame. Meeple Mountain was provided a free copy of this game for review. Our opinions are our own…but maybe you already figured that part out. Meeple Mountain reached out to the publisher to confirm that our issues weren’t an isolated occurrence, but received no response prior to publication. Ashley Gariepy is a French elementary school teacher who loves board games. She considers herself a euro-gamer at heart, but has been known to enjoy the occasional Ameri-style game. Follow @redmeeplesmash on Instagram and Twitter to stay current with the games she's playing.